When shopping at the exchange and commissary at Selfridge Air National Guard Base in Harrison Township, Michigan, it isn’t always easy to find discounts on the items you need. Plus, scouring the internet for deals from a variety of sources takes up valuable time that many military shoppers simply don’t have. 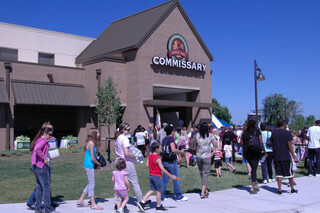 That’s why, at MyMilitarySavings.com, we’ve gathered together discount information from a variety of sources into one easy-to-navigate site so members of the armed forces can quickly find what they need in order to save big at the commissary and exchange. You’ll also be able to access the Defense Commissary Agency (DeCA) website, where you can download coupons onto your Rewards Card for instant savings on your next shopping trip. Plus, with our “My Shopping List” tool, you can create a digital shopping list just by clicking items on our site, then print it or take it with you on your smartphone for your next visit to the commissary or exchange. If you’re interested in learning more about how we can help you save time and money at the Selfridge ANGB commissary and exchange, enroll today for your free account at MyMilitarySavings.com.